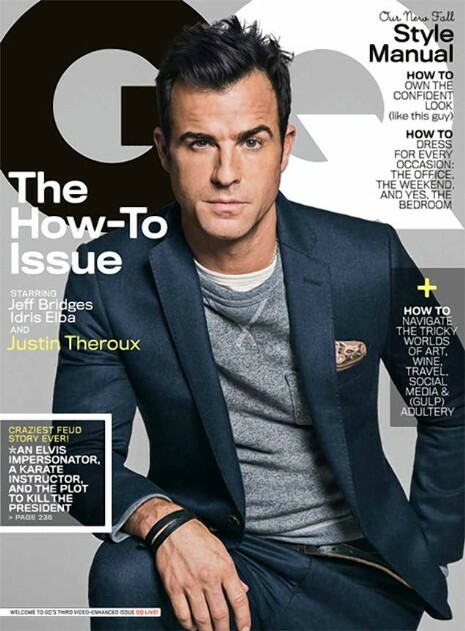 NOW we know what Jennifer Aniston sees in her fiancé Justin Theroux. For one thing, he has NO INTEREST IN SPORTS! She hit the jackpot! That means she doesn’t have to endure a future of him running off to watch football or basketball games with his buddies, or boring her with hours of games on TV. It also means he can make conversation about subjects other than scores etc. On top of that, Justin told GQ that he is appalled by men who walk around the city looking like slobs who should be on the beach – with unruly hair, wearing flannel pants and flip flops. Wait- there’s more – he doesn’t flare up at paparazzi and he has a sense of humor about tabloids – he found it amusing when someone on the street congratulated him for expecting twins! You’ve gotta love him! Jennifer has found a gem and she knows it. He cheated on the woman he was with for 14 years, so he’s not a good guy in my book. He could have broken up with her first. Cheated on his live-in girlfriend with Aniston. Yeah, he’s a prince all right! Did he discuss dying his hair and manscaping his eyebrows? It is GQ.